Kitchens seem to be a very popular request for me lately, and I have been helping a few different folks plan out and organize their cabinets, pantries, and drawers. I have also been compiling a lot of the common questions and themes that have been arising, and hope to do a post in the near future outlining how to get started and tips for creating a solid kitchen storage plan. 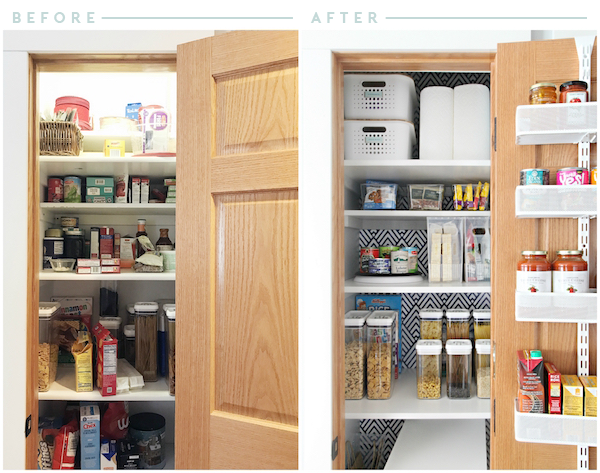 But a similar subject worthy of its own post, and a question I receive almost more than any other, is what to do with a deep pantry closet? Or any deep cabinet really. They can be such dark and confusing places and definitely require a little extra thinking and planning. One of the kitchens I was recently asked to help with, has a deep pantry closet very reminiscent of our previous pantry. I vividly remember the days of frustration and trial and error and constant reorganization. Around the time I was consulting on this project, The Container Store had reached out to me to see if I would be interested in partnering with them on a kitchen organizing story. Talk about the stars aligning just right. Their supersized kitchen sale is going on now through the end of the month, which means the majority of their very best organizers are on sale for 25% off. If you are going to stock up on your favorite bins or tackle a kitchen organizing project, big or small, now is the time to do it! I am definitely particular about the brands and sponsors I select to work with, and The Container Store was a no-brainer for many reasons. I have used quite a few of their products around our home over the years, and have yet to be disappointed. 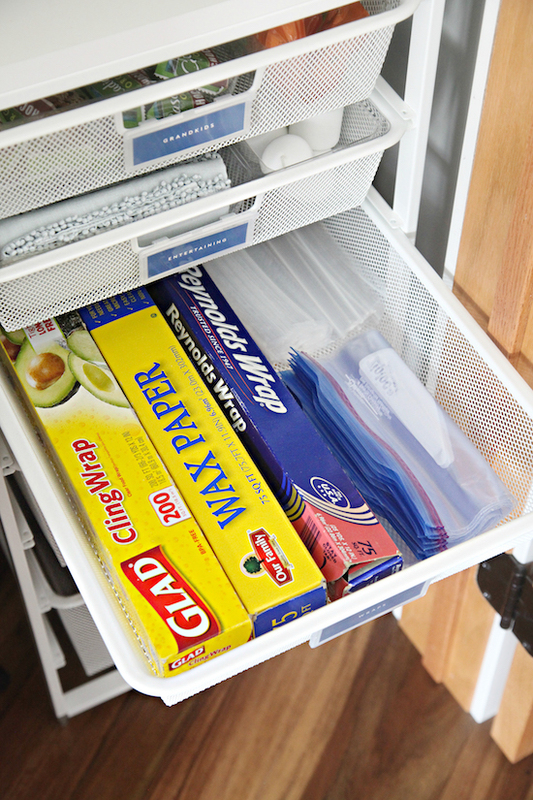 In fact, I always feel quite the opposite, especially when I have the chance to use my all-time favorite organizer ever (mentioned here, here, and here), the Multi-Purpose bin. The before and after photos of this project make my heart sing for a variety of reasons, but this post is much more than that. 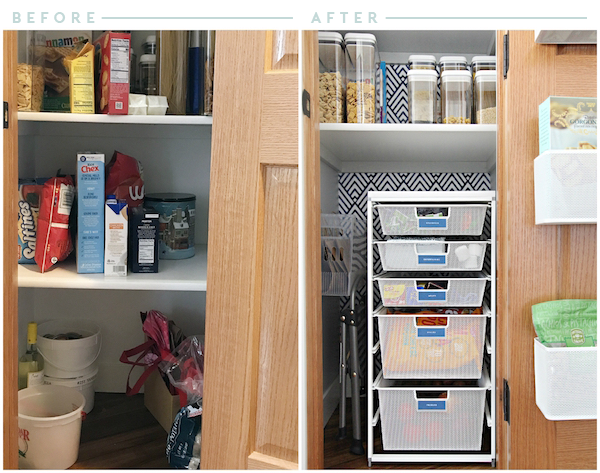 I really wanted to talk about my favorite tips for tackling a pantry, especially one that is on the deeper side. So let's check out what the pantry looked like at the beginning of this story. Look familiar? 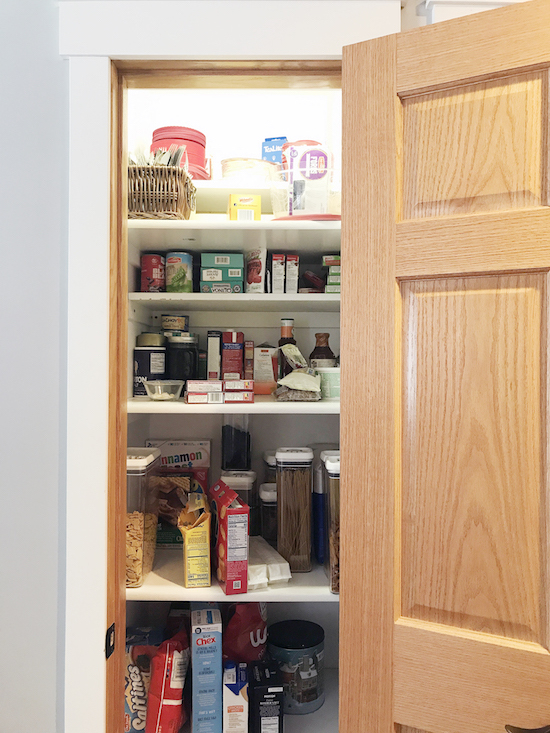 In our area, there are so many homes built with similar style pantries; essentially a 2 ft x 2 ft closet with shelves. Is this a nationwide epidemic or just regional to the midwest? Although these closets seem to be fairly common, how they are used will be different for everyone. This particular closet is used by a husband and a wife, kids have all grown up and moved out, and they now have seven grandkids who love to stop by with their parents for a visit. Their storage needs vary from week-to-week. They will buy in bulk if there are sales, they enjoy hosting during the holidays, and also like to have foods and snacks on hand for their visitors and grandbabies. It is also worth mentioning that they have alternative storage in their kitchen carved out for additional pantry items such as spices, oils, and baking supplies. 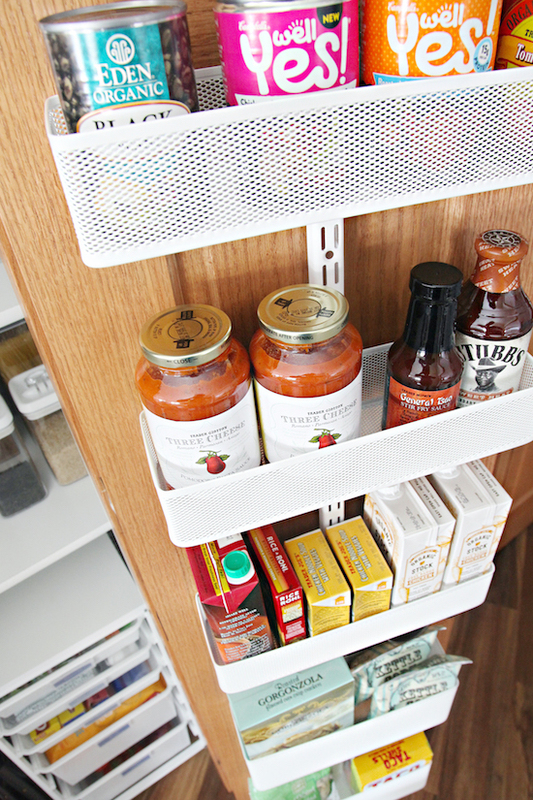 Begin with a stocked pantry. Do your grocery shopping for a typical week, and then take note of additional items you may purchase frequently and even some that may only be on rotation on occasion. 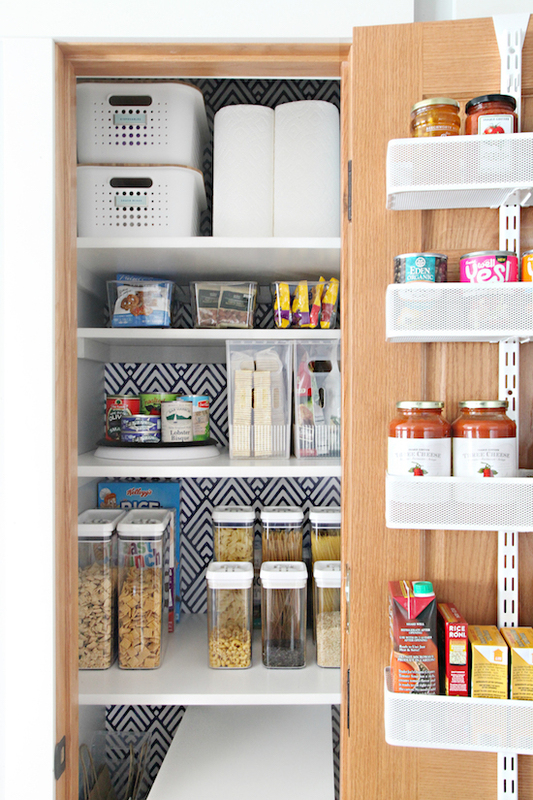 Compile a list of everything you would like to be sure is accounted for in your pantry project. 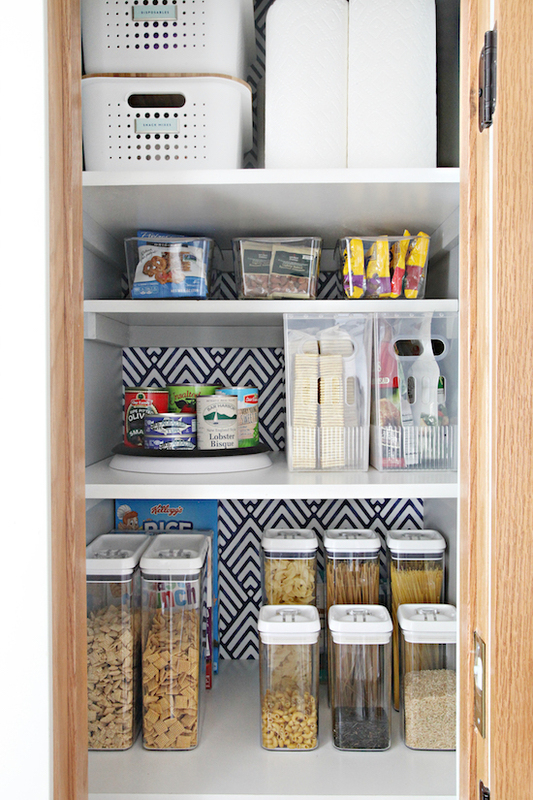 Completely clear out the pantry and any other cabinets in your kitchen that contain food items that probably should be in your pantry. Discard any items that are expired, and categorize the remainder into groupings of "like" items. As with any project, the end result evolved a bit as I began ordering and installing and doing some final assessments. But as you can see above, the plans included drawers, door storage, bins to take up both the width and the height, as well as some room for change and growth. To come up with the closet plans I measured the width and depth of every shelf. They had already installed the shelving with ledger boards and wanted to work with what they had if possible. In these types of closets, adjustable shelving may add a bit more versatility, but it definitely is not necessary. From there, I sourced the products that I thought would make the best use of the shelves from top to bottom and front to back. 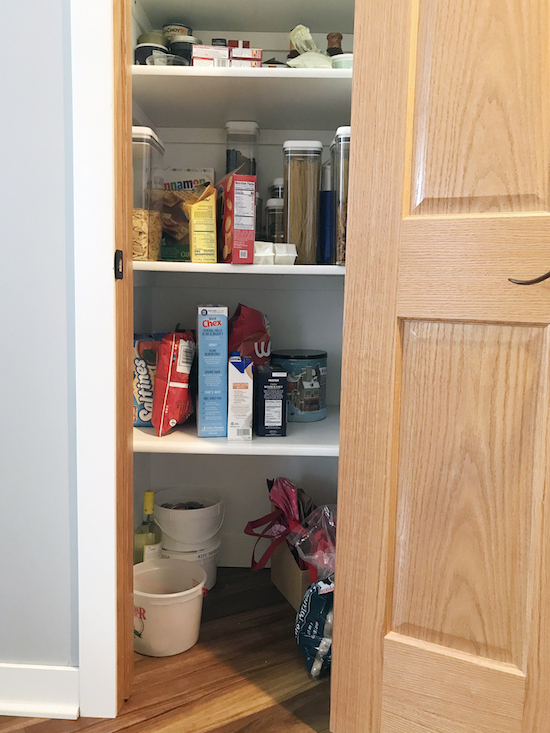 While planning, I looked at all of the items that they currently had stored in their pantry, and also considered how they ultimately wanted the pantry to function. Could we maximize the floor to ceiling shelves and add a door unit, therefore freeing up additional cabinets in their kitchen for other things? You bet! Let's talk about the beautification process. This is NOT a necessary step, but it is something that I like to do. It doesn't make the closet more effective to paint it or paper it, but it does bring a little bit of joy and happiness and can even act as a bit of a motivator to maintain it. I will never tell you that have to install wallpaper and create labels from fancy vinyl lettering if that is not your thing. Those are just the details that I personally enjoy, and that many of my friends and clients also appreciate in the work that I offer (some people like to decorate rooms, I like to decorate hard working cabinets and closets). My plan recommended removing the bottom shelf of the closet, so because we were going to patch and touch up paint anyway, I decided to paint the entire interior of the closet the same color as the adjoining kitchen walls with some of their leftover paint. Once it was dry, I also added a peel-and-stick wallpaper between each of the ledger boards for some additional wow. The paper is temporary and removes just as easily and quickly as it went in (no residue or commitment necessary). As things were coming together, the pantry owner walked by, caught a glimpse, let out a happy shriek and clapped her hands. This is 100% what it is all about for me. I almost cried seeing how happy she was with her new closet coming together. If you take anything away from this post, it is to add drawers whenever possible. Drawers will take advantage of the area from front to back, and naturally bring the items from the back forward for you (vs. you needing to move things or reach over things). 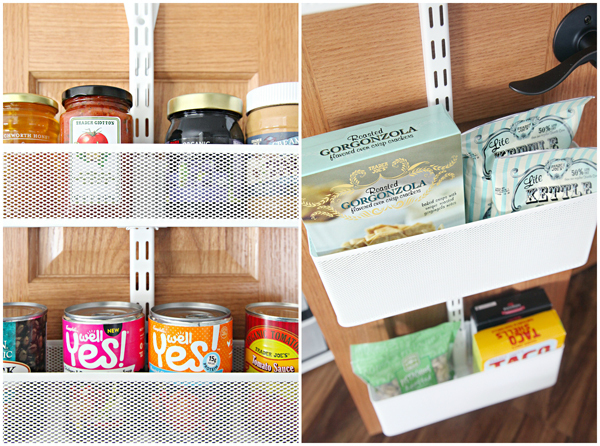 I added drawers to this pantry in a couple of ways; you can be as literal or creative about it as necessary. I do consider some types of bins as drawers, they can serve the same function and bring items from the back, forward. The most impactful set of drawers was added at the bottom of the closet via a narrow elfa drawer unit. 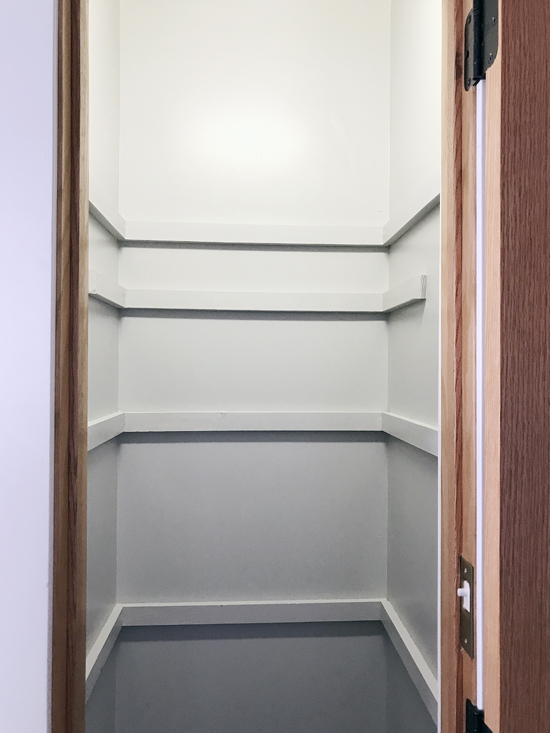 Originally, the closet had a single shelf and the floor to hold the items in this area, but now there are five nicely sized drawers, as well as a spot for a step-stool, a place to store grocery sacks, and even a little room to grow! Hello increased functionality and storage! For this particular elfa combination, I picked two of the narrow 2-runner drawers, three of the narrow 1-runner drawers, then added a narrow white melamine topper. 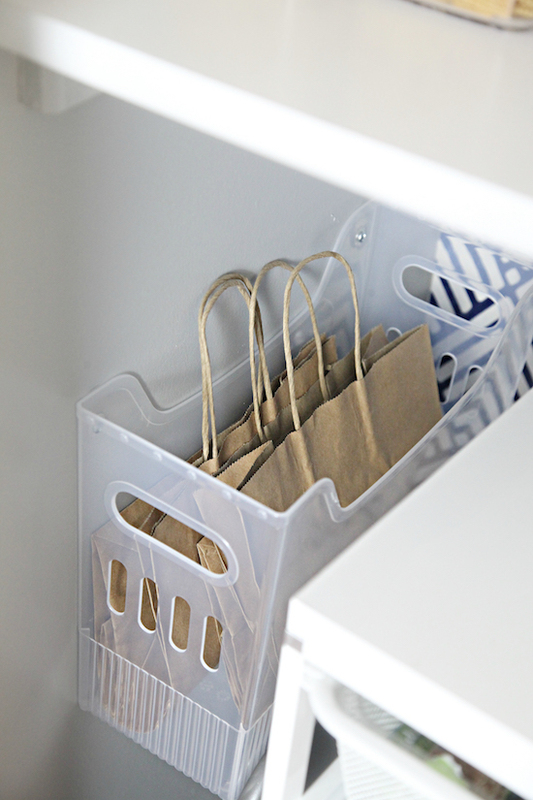 Bag holder is a medium Multi-Purpose bin affixed to the closet wall with screws. Closets like this can be tricky in terms of drawers because there are a few inches of recessed shelving area on either side of the door, and finding ways to not lose that space requires a little extra thinking. Although I knew we were already gaining storage by adding the elfa drawers, which are slim enough to pull through the narrow door opening, I was even happier that we were still able to add a little extra function on the one side of the drawer unit as well. I was going to wait until a little later in the post to show how amazing these drawers are, but since we are on the topic, let's take a closer look inside of each one. This elfa combination is small but mighty and comes in at just 21" deep, 14" wide and 29" tall. Looking at those dimensions I was wondering if it really could store as much as I planned and hoped, and it certainly surprised us all. The top drawer was created just for the grandkids. The homeowner mentioned that her grandkids will come over and know right where to look in the fridge for drinks and snacks, and she really wanted to duplicate that concept in the pantry. The elfa drawers are easily organized with fitted and divided clear trays, so I added them to the top two drawers to do just that. Very convenient! 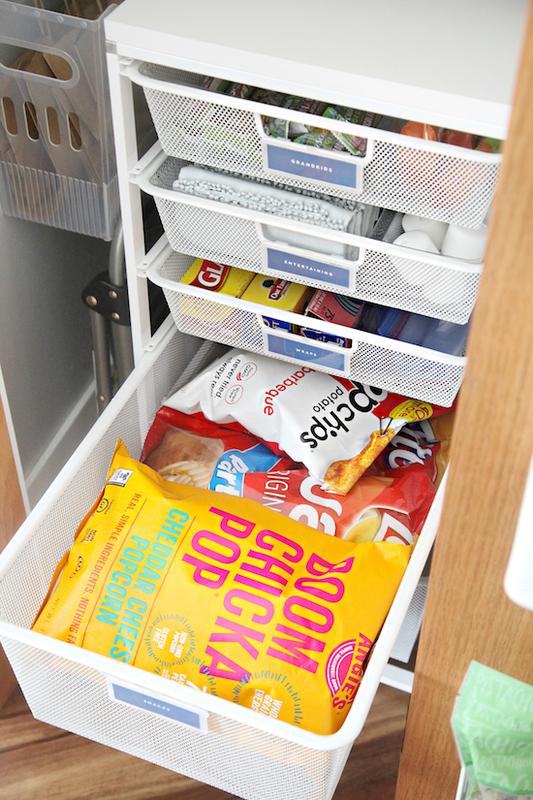 I am pretty sure the snack drawer was the homeowner's favorite, her reaction was priceless! 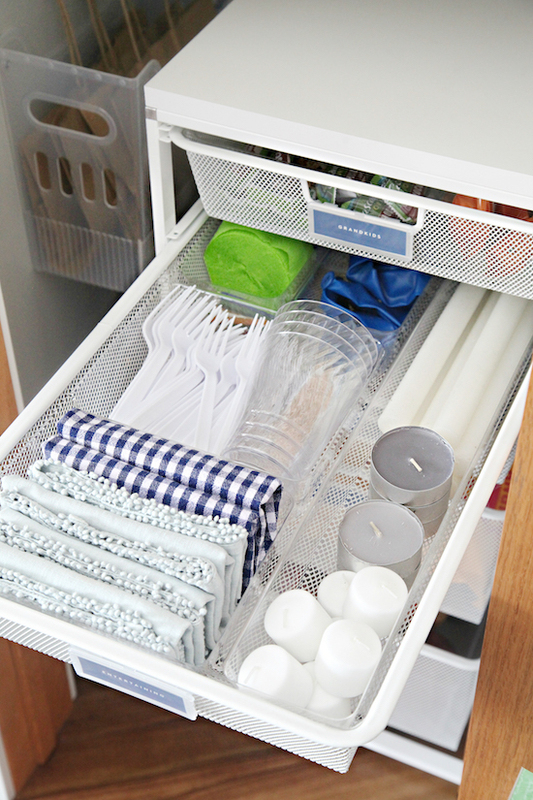 These slim drawers are also nicely sized for food storage bags and wraps. While a deeper drawer conceals large bags of popcorn and chips. Last but not least, the bottom drawer now holds their produce, which was previously being stored in some buckets on the floor. I lined the drawer with a couple of basic bins to catch any juices or onion flaking. Quick Tip: Anytime I post about storing veggies, I do caution that keeping onions and potatoes together may increase their spoiling time. 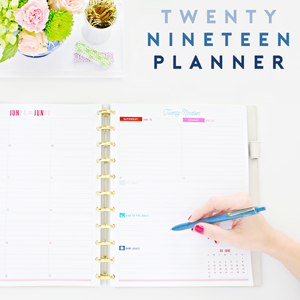 If you are only purchasing what you need for a week or two of meal planning, they are probably fine to be stored together (we have done this for years and never had any issues). 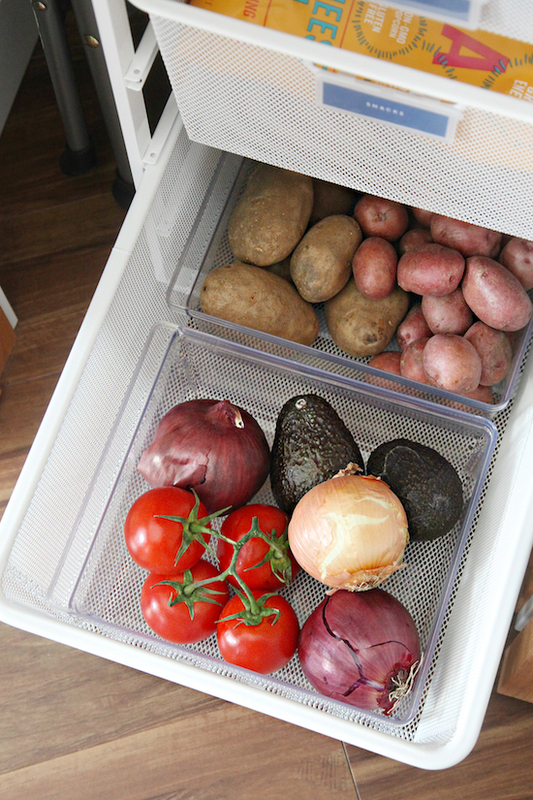 But if you want to keep your potatoes for longer periods of time, they can be stored inside of an open box or paper bag in a cool, dark place (away from the onions). 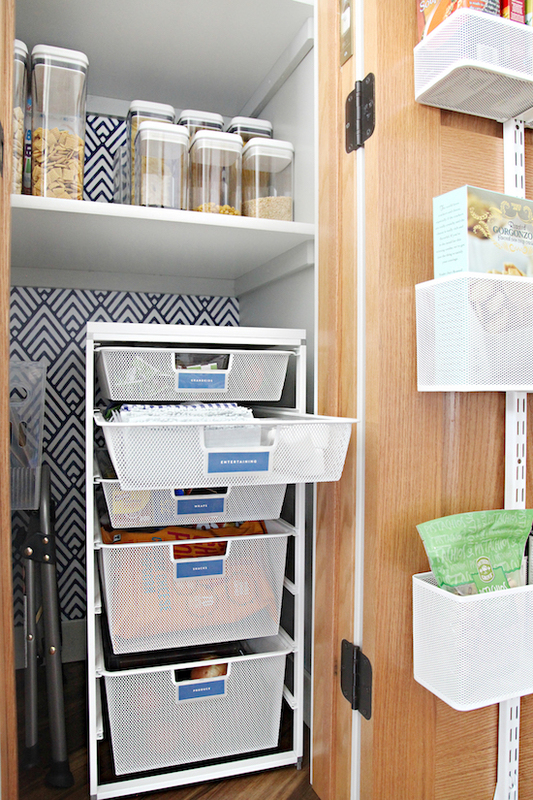 As I mentioned above, I also used a few bins as drawers; specifically, these small clear Linus Handled Bins for a shorter shelf and my favorite Multi-Use helpers for some lighter weight cracker, snack, and pouch wrangling. Previously, there was no finding anything on the back of that shorter shelf without moving a variety of items out of the way first, but now the bins easily bring the smaller items out of hiding. Quick Tip: Most often times product packaging and boxes can create added bulk in your pantry, and you may find that quickly removing the box and storing the contents in a bin or drawer will give you twice the space. 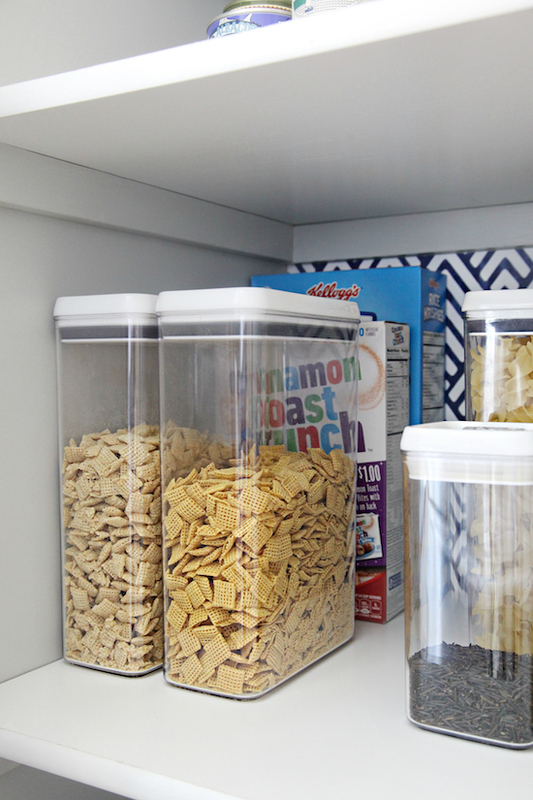 I like to keep a small vessel of clips in our pantry so we can remove crackers and cereal from the boxes and clip them closed to keep them fresh between uses. There are times when boxes may actually Tetris stack nicely, but I encourage you to give it a try. You just may be surprised about the space you gain. 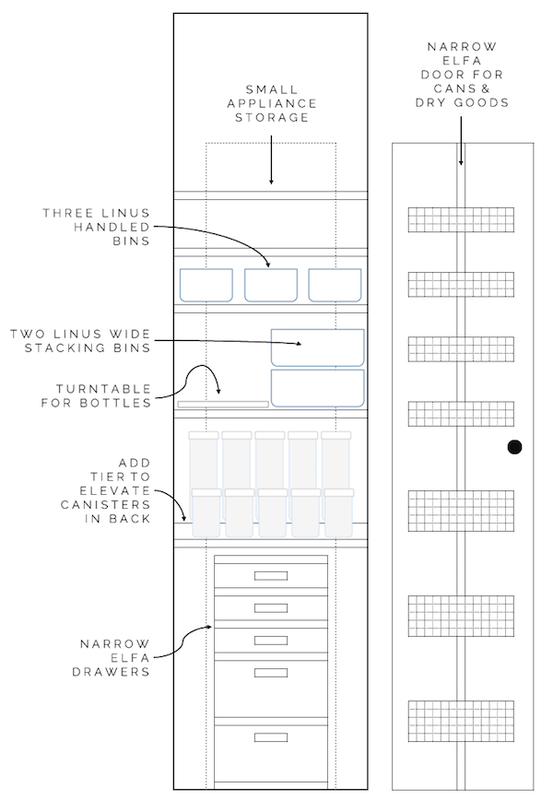 Tier your storage and your shelves! In the initial plans, I included a shelf/tier of some sort for the back of the shelf that held all of their canisters and containers, but once we cleaned everything out, that wasn't exactly necessary. I still placed the taller items near the back, and the shorter items in front, but there was enough space left to create a path that would allow some easier access to all of the boxes and containers with little disruption to the setup. 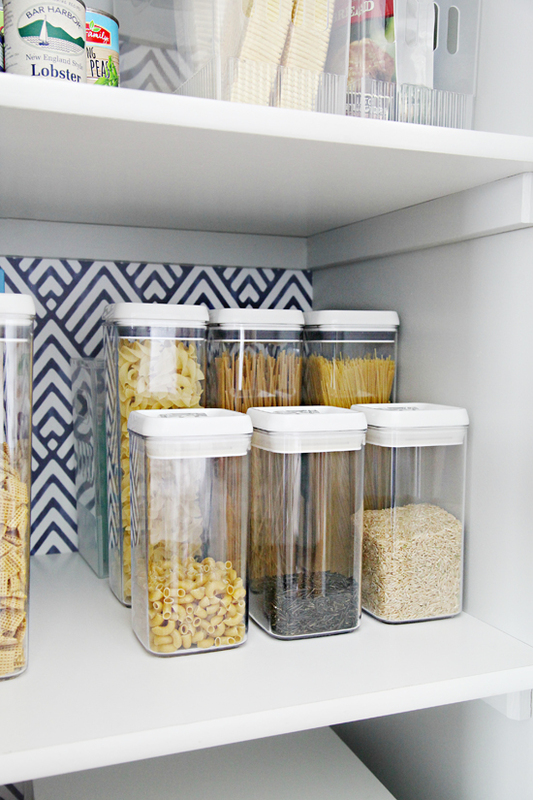 Quick Tip: Place your everyday food and containers near the front, and store your overflow items near the back. In this case, extra boxes of cereal are placed behind the cereal containers, and extra boxes of grains and noodles were stored behind the pasta/rice section in another Multi-Purpose bin. This closet was installed with a few full-length shelves throughout, as well as a couple of shorter shelves that were set further back. 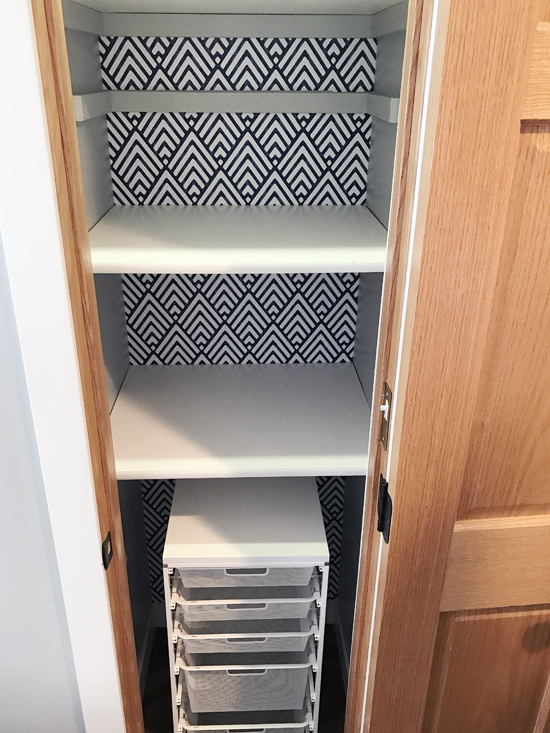 I appreciated this so much because it added an additional row of storage without impacting the overall accessibility of the other items in the closet (especially when the drawer-like bins were added). Maximize that vertical space and use the door or walls of the closet. Although the door and walls are narrow, it doesn't mean some narrow baskets or shelves can't be added to increase the usable storage area. I initially considered spice racks on the recessed areas of the walls, but with all of the storage we were able to add to the door, we didn't end up needing the spice racks after all. I have used the narrow elfa door rack in our own home for storage in our hallway closet, I can't rave about the system enough. It is sturdy, versatile, easy to install, and won't do any damage to the actual door. Not to mention, the baskets come in a variety of sizes and can be mixed and matched to fit the space beautifully. The mesh baskets come in two widths (I went with the narrow), and a couple of different heights and depths. The shorter baskets can hold everything from cans to jars to small packets, while the deeper options are great for boxed foods, tall packages, and pouches. 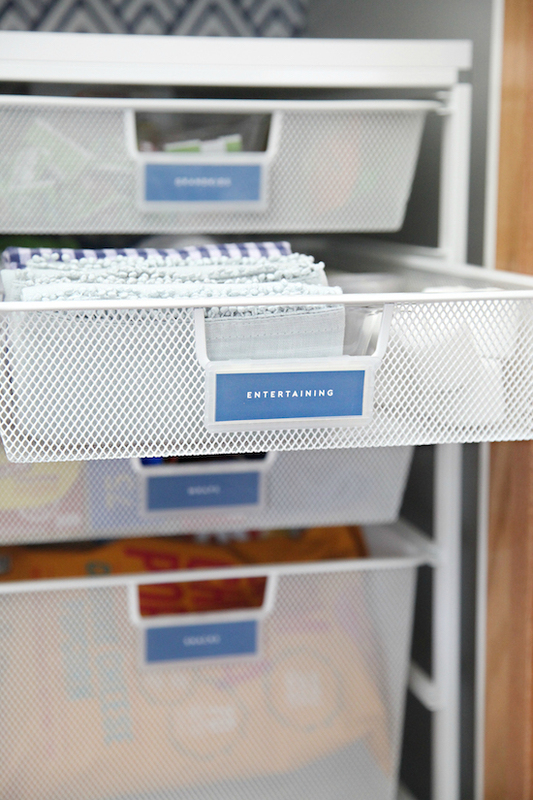 The organizer is mounted with two over/under the door hooks that are tightened into place. 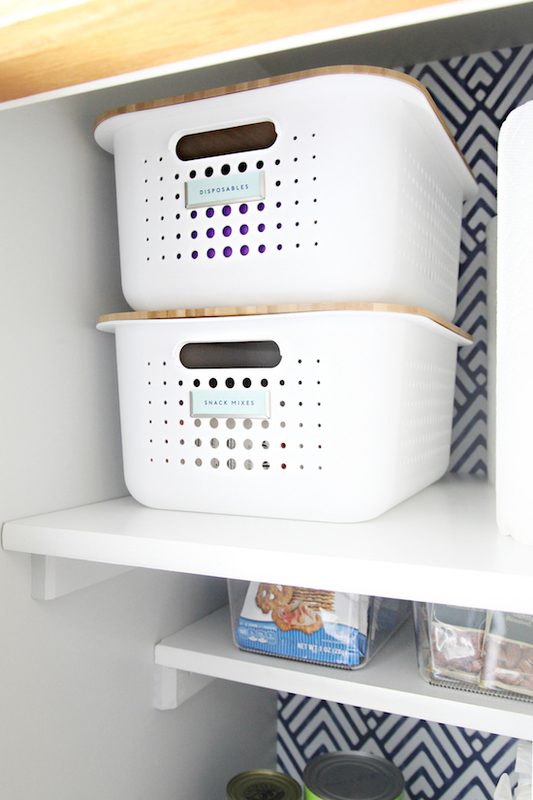 When the door is closed, the baskets live inside the door jam area, not at all intruding into the actual closet. 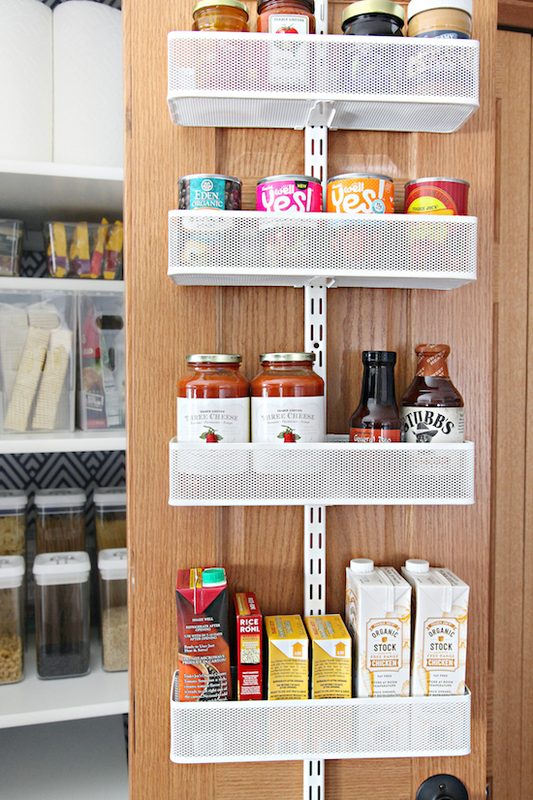 In this situation, a tiered shelf may have used the space a bit better due to the available height, and it is definitely an option to easily swap things out down the road if necessary. This lazy susan can always be reused under the kitchen sink for cleaners, in the fridge for condiments or near the stove for oils, salt, pepper and cooking sauces. Categorize and store items based on how they are used. Originally we planned on storing small appliances up on the upper shelves, but thanks to this closet project, we were actually able to keep them in another location and save the homeowners from having to pull down heavy items from an upper shelf. That said, paper products now have plenty of room on the top shelf, as do some white stacking Nordic baskets filled with disposable dishware and ingredients used for on-the-spot snack and treat making with the grandkids. The items stored on the upper shelf should generally be things that you have on hand for convenience or special occasions or larger items that you purchased in bulk at membership-only warehouse stores. 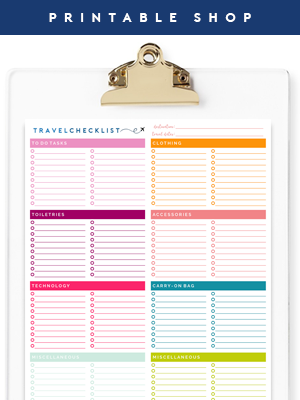 Pulling out a stepstool to reach that upper shelf each day will become cumbersome over time and the goal is to streamline your daily processes. By placing some of the awkwardly shaped items into baskets, it visually cleared up the available space and made it much easier to bring it all down to the counter in one swooping motion. Quick Tip: Speaking of making things as easy as possible, stacking bins and baskets are absolutely fantastic. Buuuuut, they are not really a great option for everyday items and accessibility. Do you want to have to remove a basket just to open a lid and access another basket? No, you don't. Especially not on the daily as that would get old pretty quickly. Stacking baskets are really wonderful for maximizing height, I just recommend you think about how often you will need to get to the actual contents inside of the bins/baskets, and also consider using stacking options that have open fronts for the items used more frequently. The last step I take in any organizing project is to label everything so everyone in the house can be on the same page and take part in keeping it somewhat tidy. And also so that concealed items are quickly identified and easy to locate. How much to label is always a debate, and there are times I have felt the need to label my kids' backpacks, pencils, foreheads, and toothbrushes. When there multiple small kids involved, everything is easily mixed and lost and confused. Also, getting the entire fam clan on board with putting things back where they belong, even in seemingly obvious situations, can be a bit of a challenge. So, while some people are strong Team Label people (I am right there with you), there are also times when it is necessary to pick your battles. For example, if you have clear containers and can see the contents, do you need to label them? Especially if it contains items that may change time and time again based on your meal planning and supply levels? Probably not. However, if you have clear containers and one has flour and one has powdered sugar and one has gluten-free flour and another has baking powder, labels are extremely helpful in identifying products that look the same but definitely are not. Labeling is also important in the pantry when allergies are involved. 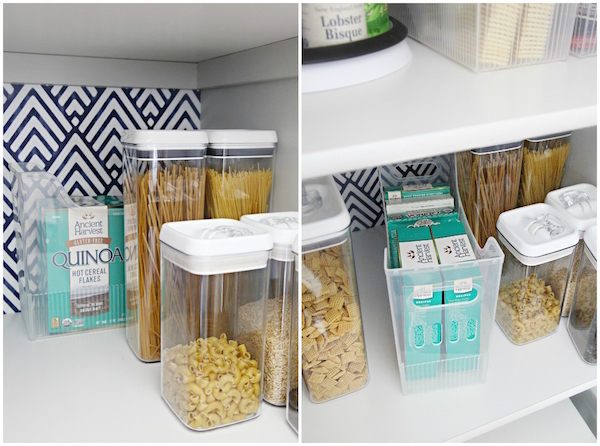 In this closet, I labeled any bin or basket that was not clear or see-through, and nothing more (I used these label holders with the elfa drawers and these label holders on the white stacking baskets). 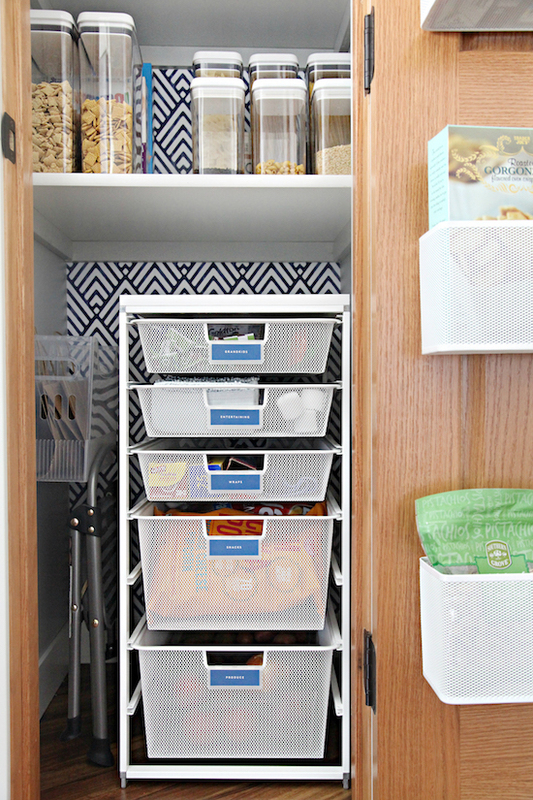 The small clear drawer-like bins can be used for a variety of snacks and mini-packages, the larger multi-purpose bins can hold a mixture of pouches and boxes, the airtight food canisters can store cereals and pasta as needed (while offering the owners a quick visual inventory of the contents), and the door baskets can serve endless functions as groceries rotate through week after week. One of my bonus tips is something I always recommend when working on these types of projects, and that is to leave a little white space. Life changes, needs evolve, and it is almost always inevitable that something won't be taken into consideration during the initial planning phase. Having extra space allows for some flexibility down the road, and also allows your space, and yourself, to breath a little easier. It is always good to maximize your space, yes, but you may find that with the right products and systems, that you actually have more space than you initially imagined. 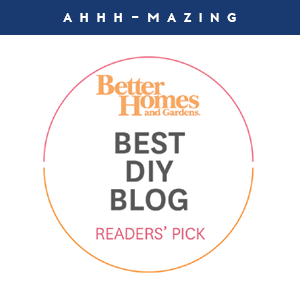 I loved walking away from this project confident that the homeowners will continue to have room to grow and play with this closet, and that their overall usable space more than doubled with the help of these particular tips. I love it so much that I sort of wish I could pick it up and transplant it into our own home! Never did I think I would say that about this type of closet or setup again. And if you adore it too, the majority of these tips should be simple to translate and work in your own pantry, even if you are a renter! The product is all very versatile and removable, right down to the peel-and-stick wallpaper. Don't forget! 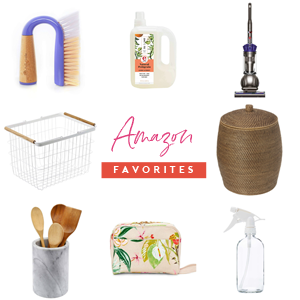 Many of the products shown in this post are on sale through April 1st, and you can save 25% off of so many great kitchen organizers and storage containers. I’m on the east coast and my pantry and linen closets have those deep shelves. Definitely a waste of space. Thanks so much for the post and the sale info at the container store! I’m ordering today! You did a beautiful job! What a difference! This is so helpful!! I have a narrow pantry that has baffled me for years. I skipped the planning step, thus was not pleased with the result. Thank you for all the great ideas. I had one tip to add for those that decant bulk foods like rice - I label the rice container not just with what kind of rice it is, but the water to rice ratio to cook it, i.e. Instant Rice is 1:1 but Basmati Rice and Jasmine Rice are 2 parts water to 1 part rice - I know this because I do most of the cooking, but if my husband wants to cook rice, he doesn't have that memorized so it saves him from having to go look up how to cook rice, haha! Yes! Thank you for mentioning this! Another option (what this homeowner did) is to cut the cooking directions from the packaging and tape them to the bottom or back of the container. :) Glad you brought it up! 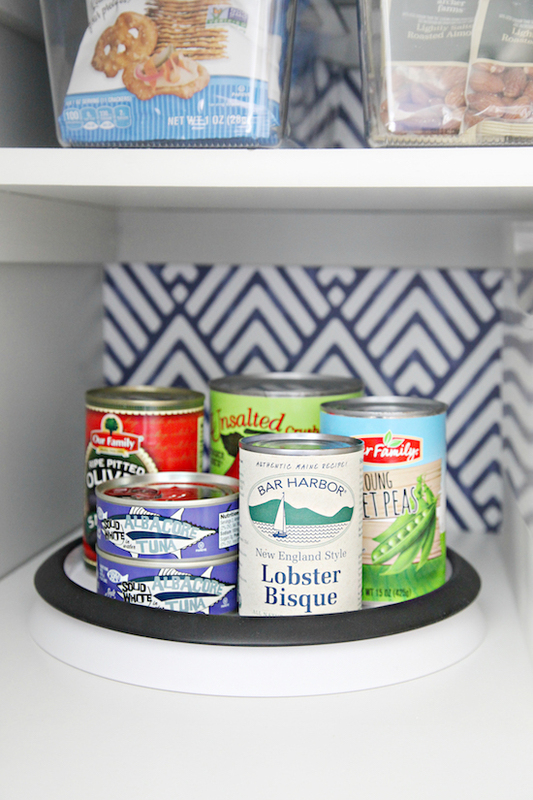 Do you have any suggestions for labeling the deep, horrible wire shelving in most pantries? We rent and move often because my husband is in the Army. It seems every pantry has that shelving. The shelves are deep and tall. Cans are my biggest issue, but I’d also like to add some labels but have trouble finding ones that stay but can be removed easily when we move. Hi Katharine! I haven't tried anything on wire shelves personally, but wonder if your best option might be to find something that ties on to the wire grates? Or something you could attaching with small binder rings? Katharine: try binder clips! Attach a small label to the black "spine" of the binder clip, then clip it horizontally onto the wires! 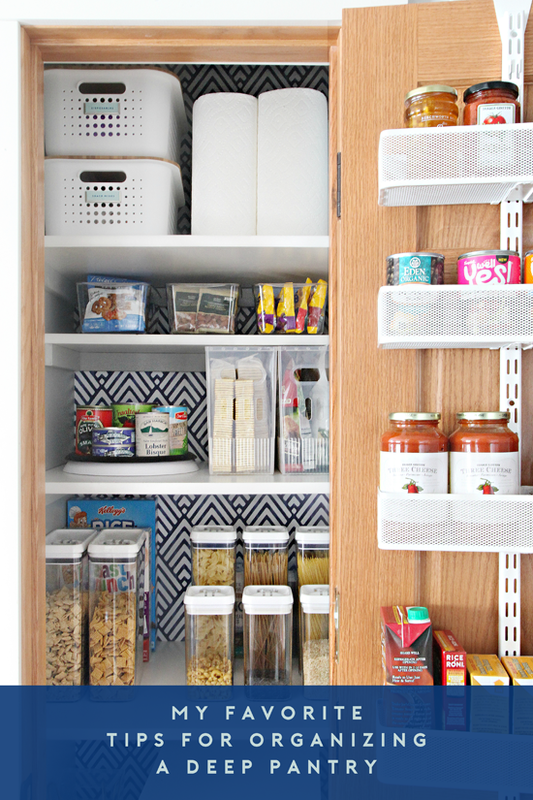 This has encouraged me to reorganize my pantry this weekend. Thanks. Looks amazing! Well done Jen! It's like you read my mind! I finally decided to tackle our deep pantry this week and ordered $250 worth of stuff from TCS! I'm really hoping all my visioning/measuring adds up haha! 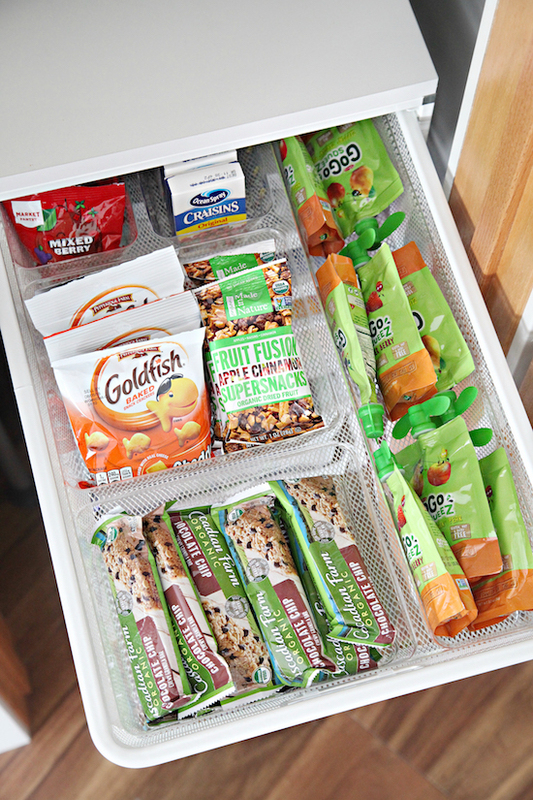 I love love love those Elfa drawer units! But mine has pull out drawers, so I'm thinking about other spaces I can use them in! I love this!!! These types of pictures make me so happy. I’m wondering if you can see the door rack clips on the outside of the door when it’s closed? I think this would be a great way to add space to my tiny linen closet. Hi Amanda! You can see maybe 1/4" of the clip, it is pretty minimal, but still there. The channel used for the elfa unit is designed to be installed on either a door or a wall, so they could also be screwed in, but that would then be a permanent add to your door, and it would also have to be installed on a solid door. Love love love this post!!! Such great tips and I am still drooling over all these gorgeous pictures. 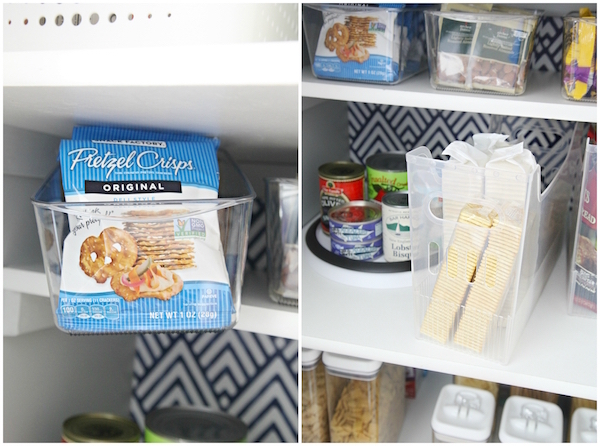 I have a deep pantry in my house as well (and a deep linen closet!) and can't wait to implement some of these ideas in both spaces. Thanks for the great tips!! Oh man I just love your ideas! I have a blind cabinet in my kitchen that is a disaster because the door opening is so narrow and then expands into a huge cabinet that is inaccessible unless you sit on the floor to reach everything. I would love some ideas for it. I've never found anything unless I want to spend hundreds of dollars on it. Excellent post :D. Can i ask what software do you use to do the planning proposal? I love this! It's so inspiring. 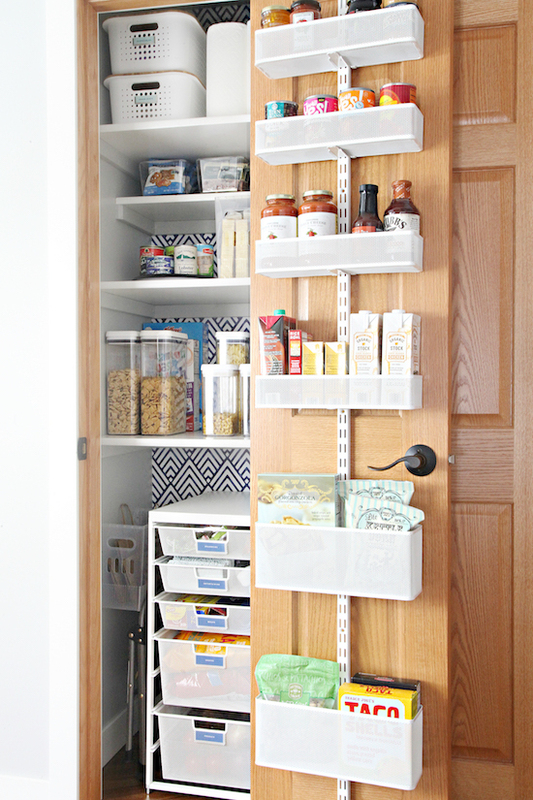 We have a similar pantry closet in our new house, and I would love to create something like this when I get around to it! Mine is very spacious, about 3 feet wide by 3 feet deep, and probably 8 or more feet tall (it's too tall, I can't reach to measure it). It would be great as a small walk-in, but it is split into three sections, each with a set of cupboard doors (imagine three double-door kitchen cabinets stacked, only much deeper). Each section is cavernous and dark and difficult to organize, and the center bar the cupboard doors rest on when shut make it difficult to reach in (and impossible to install those pull-out shelves). If I have to reach into the back, even with my arms fully extended it swallows me up to my waist—and I'm not short! I'm 5'8". I can't reach the top section without a step stool, and even then I can't reach the upper half of that top section. The ceiling inside goes much higher than the cabinet doors lead you to believe. And I'm in Texas, so it's definitely not just a mid-west problem. Any advice? I've tried looking for drawers or bins to organize with, but even the long (deep?) ones are not nearly long enough. This is my first place of residence that even has a pantry, so I'm thankful that I have it. But I'm at a loss at how to manage it. I feel tossed into the deep end of the world of pantries, without ever being taught how to swim! That would be such a big help! I'll e-mail you right now. Thank you! Love love love! Where did you find your peel and stick wallpaper?? Thanks, Liz! The paper is from Wayfair: http://bit.ly/2G6JJmC, and can also be found on Amazon: https://amzn.to/2HZZNaw. Wonderful overhaul. I bet this was one happy client. There are numerous parts of it that I loved. Thanks for sharing. I will never tire of hearing these types of comments, and is the biggest reason that I love doing what I do! Thank you so much for sharing!!! 💓 Congratulations taking back your closet, I bet it feels amazing! Took me forever to read this post.... so much good info! Thank you! The paper is from Wayfair: http://bit.ly/2G6JJmC, and can also be found on Amazon: https://amzn.to/2HZZNaw. 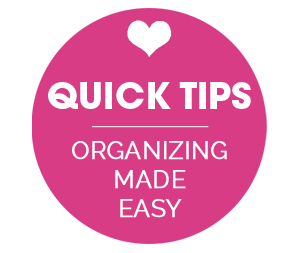 You are the organizing goddess! I've been struggling with pantry storage for the past month and have tried many options. This post has given me so many tips I can't wait to use. Thanks so much! Watching your work is so satisfying. Thank you for the great tips! You did a great job! Where have you gone!?! We miss you! Missing you and your wonderful work. Agree...miss your posts. I keep coming back to check for a new post...Hope all is ok.
Hope all is well with you and your family. You are missed. I haven't been checking back with you so it's great to see all your recent posts! I don't have a pantry in my tiny downsize apartment kitchen so I store all those items in a recycled Ikea children's armoire sitting right outside the kitchen. I can use many of your tips and will get on that today. I do very much enjoy your posts and find them helpful … and I may add a shelf from your son's new bedroom to a blank spot in my kitchen! I know this is a few months old, but I still want to say how inspired I am by this post! Thank you so much for sharing it. My husband and I are renovating the house next door to ours with plans to flip it (long story--we are not professional house flippers! ), and I was googling around trying to figure out what to do with its really horrid little pantry. This gives me such hope! I'll give it a shot and send you before and after pics if I'm successful. This house has some definite drawbacks that I can't do anything about, but I want the future owners (who will be our neighbors) to walk in and see some things that spark joy.